Robert Archey Woods, Settlement Worker, South End House, Boston, MA. 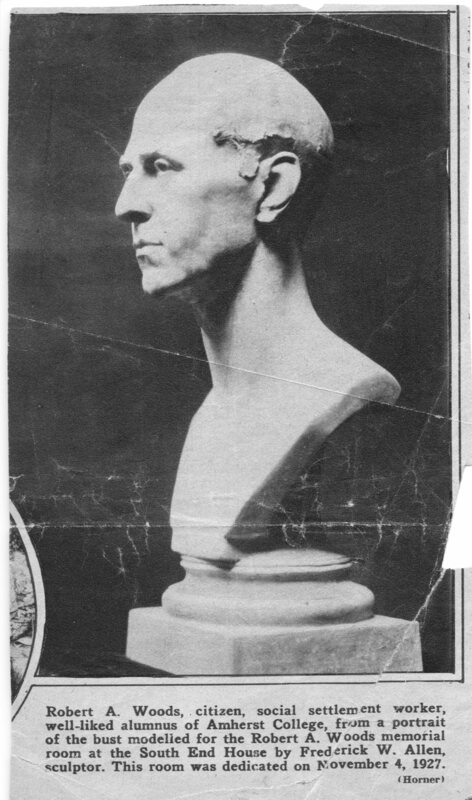 Original clay bust modeled in November 1927 by sculptor Frederick Warren Allen. Photo by Arthur Hammond. Born into a family with an immigrant background, spiritual interests and a social conscience, Robert Archey Woods took the plight of the poor and disadvantaged to heart. After his father’s death when he was just a young man of fifteen, he turned to his mother, herself an Irish immigrant, for advice. Education was important to this family, so he aimed his sights at continuing after high school, first graduating from Amherst College and then attending Andover Theological Seminary. His interests centered on social justice. He sought a “practical application of Christianity” and a philosophy that would offer social salvation as well as spiritual salvation. Following his graduation from Seminary, he travelled to England to study the settlement movement there where educated men were given the opportunity to live and work among the poor. Returning inspired after six months, he teamed up with Dr. Tucker, his Andover professor who embraced the same interests, to establish a settlement house in Boston. The Andover House was the result and was opened with four male residents in 1892. Woods was given the job as the first Head Worker. Activities and programs at the House stimulated rapid growth in many directions under his leadership. In 1895 the name of the house was changed to the South End House, the name it retains today. He worked with dedication to expand the role of Settlements in America and to create social work institutions. In 1911 the National Federation of Settlements was launched and Robert Woods became its first Executive Secretary. The members quickly became involved in many progressive social issues and published information that lead to further growth. Woods was at the helm where he became president of the National Conference of Social Work in 1917 and then President of the Nation Federation of Settlements in 1924. His career ended suddenly in 1925 at age 60 from the effects of a short illness, but his work has been carried on to this day. Portrait of Robert. A.Woods by Boston School painter Joseph R. DeCamp, 1918, seven years before his death (1865-1925). Auction by James D. Julia, Inc. The Boston School painters attracted much attention in the golden years of art in Boston. A commission was awarded to Joseph R. DeCamp in 1918 for a painted portrait of Robert A. Woods. DeCamp was one of the important Boston School painters who taught at the School of the Museum of Fine Arts. The Museum School was located just a little over a mile from the South End House. With a connection already established to the SMFA and the reputation that Allen had for taking death masks and for capturing accurate likenesses with personality, the choice of what sculptor to use was simple and brought him the work for both the mask and the portrait bust. 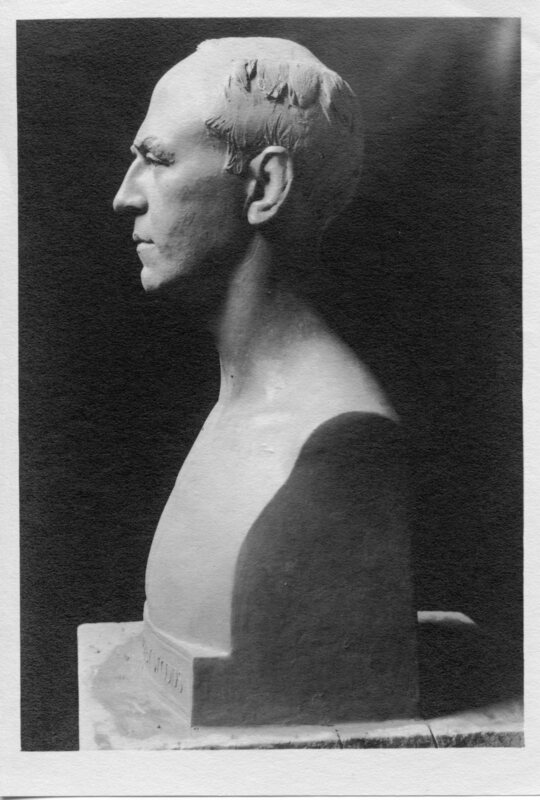 Taking the shape of the head, the long neck and chest, and the primary features of the face from the mask and the man’s body, Allen was able to create a portrait of a younger man in his first version. Shown above is the original, modeled in clay. The presentation is a dignified herm bust with a lifelike bare upper body in the classical style, the cross-section of the body at mid-chest level incorporated into a block base. The second version is more decorative and appears to be a plaster cast. A carved stone sculpture might have been too costly and the color indicates that it is not made of bronze. The head and front of the chest have been separated from the blocky herm base. The chest is narrower and the back has been cut away to rest on the front edge. It is raised from the base on a socle with a neck, mounted on a flat square plinth similar to the base of a round Ionic architectural column. Robert A. Woods, first head Social Worker at the South End House in Boston, MA. This version as an older man in a more decorative format for display. Frederick W. Allen, Sculptor. The other most noticeable difference in the two versions is the hair. In version #1 he has has a head of hair and in #2 he appears to be older and balding as he was in the portrait by DeCamp. The eyebrows seem to be thinner and the skin around the jaw has dropped a bit as would be expected of a 60 year old man. Notice how high his forehead is on the case of his skull, tall enough to hold a large thinking organ. The portrait is sensitive, calm and intelligent. He was a creative thinker and a reformer with ideas that made a difference to the improvement in the lives of those who would otherwise have been neglected. Note on the photo: The early image in clay was one by the famous photographer Arthur Hammond, who lived in Boston from 1910 on for most of the rest of his life. He wrote an important book on composition, Pictorial Composition in Photography and helped edit American Photography for 40 years until 1949, wrote many articles, made his own pictures and was widely exhibited. In 1944 the Smithsonian presented a solo show of his work. Seni-Lunar, taken at the 1939 World’s Fair is an enduring example of his work.